Compatible with iPhone 3GS, iPhone 4, iPhone 4S, iPod touch (3rd generation), iPod touch (4th generation) and iPad.Requires iOS 5.1 or later. The combination of tuning and tempo management tools makes a great companion for every musician, the nifty recording feature comes as a nice bonus. The app utilizes the built-in microphone capabilities of your iPad, iPhone or iPod Touch and turns it into a tuner, or a basic recorder for capturing your musical ideas. The tuner lets you tune from A0 to G#6 with an accuracy of +/- 0.25 cents about A-440 (1/400 of the distance between A4 and A#4). The recorder lets you record your ideas as WAV files which you can easily download into your computer via iTunes. Finally, this virtual toolkit also comes with the often overlooked metronome. It has a simple and intuitive interface that lets you set Beats/Minute, Beats/Measure, and Subdivisions/Beat. 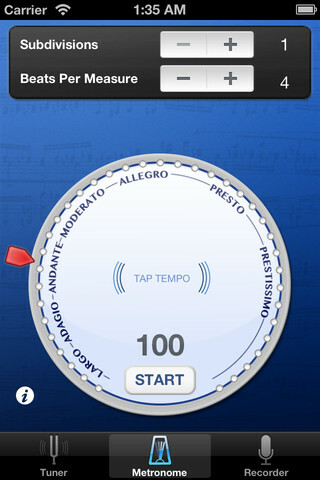 It even lets you tap in your own tempo for easy synchronization with a recording or that tune you have in your head. Plus/minus buttons on the metronome for fine tuning your tempo selection. Some users reported that the metronome and recorder showed up as blank screens and did not function at all. 1.2 should eradicate all of those bugs. The playback animation on the recorder now runs smoothly on all devices.